White Dwarf #76 takes us back to April 1986. The magazine feels a bit larger than past issues (68 pages now) and there is more color. 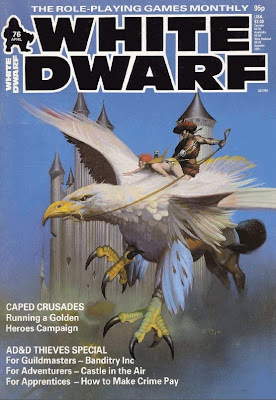 The cover features a could of eagle riders in a tie in with the AD&D adventure.The cover artist is Peter Andrew Jones, who I do not recognize. The editorial covers the demise of such columns as Fiend Factory, Star Base, Crawling Chaos, Rune Rites and Heroes & villains. But we knew this. Also, and maybe they are taking a page from Dragon, they planning more "theme" issues. This one is all about the AD&D thief with two articles and and an adventure. Open Box opens up big this issue with 3 pages and 7 reviews. Iron Crown Enterprises has some MERP offerings. The Riddle of the Ring board game (6/10) and Erech & The Paths of the Dead Scenario (9/10). Alone Against the Wendigo is a CoC solo adventure. Surprising there are not more of these to be honest. (8/10). Send in the Clones is also reviewed. This is the only Paranoia adventure I have ever played myself, so I have nothing to compare it too. Marcus Rowland gives it 6/10 and that matches my memory of it. Graeme Davis LOVES Lankhmar, City of Adventure for AD&D (10/10), I'll admit it has made me want to read the Fafhrd and Grey Mouser books more than once. Two Doctor Who RPG adventures are covered The Iytean Menace and the Lords of Destiny. I loved the Doctor Who RPG from FASA but I never played these. They get a collective 8/10. Finally Hero games gives Fantasy Hero, it gets an 8/10. The first article on AD&D Thieves is up. How to Make Crime Pay is for players in the form of a lecture from a guild master. Once upon a time I would have eaten this up. In fact in 86 my favorite character was a thief turned assassin. There is nothing in this article that screams "D&D only", it could be used with pretty much any fantasy game. Accounting (no joke) is covered for Judge Dredd. A scenario for Warhammer is up next. The second article on thieves is up, this time for the DMs/Referees. Again, useful, game-agnostic advice. This one is more in the form of tips and tricks and advice rather than a narrative. 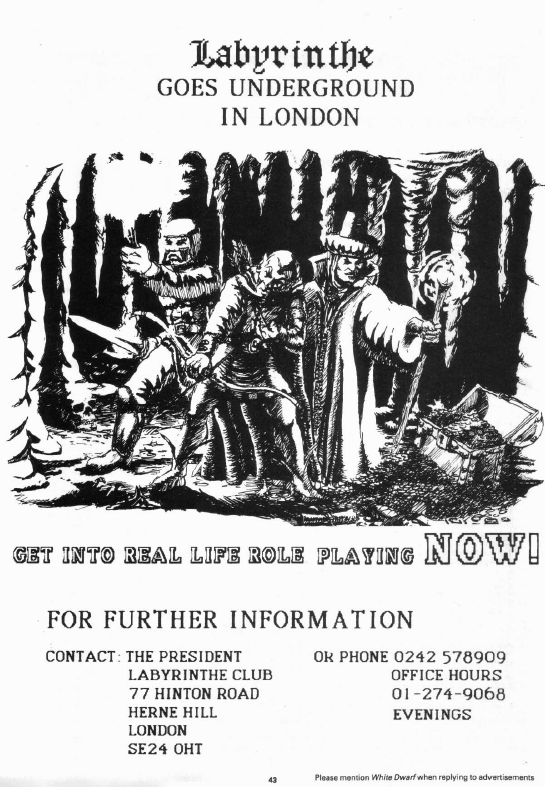 Actually this would have been a good article to have back in 86 when I was working up the details of the various guilds in my game world. Today I just hand wave that sort of thing away. An article on running Golden Heroes is next. There is also a lot of good advice here too for any supers game. I think the next supers game I run there will be a tabloid, ala The Sun, involved. Castle in the Wind is the next article on thieves and takes the form of an adventure. This one in pure AD&D and the thief connection is a touch thin. It's long and detailed and with a dash of Hayao Miyazaki it could be really, really awesome. I might have to xerox this one for later use. Plus I love floating castles in my D&D. Treasure chest is still around, at least for now. It has half-a-dozen new spells. Never can have too many of those. There is this interesting ad for "Labyrinthe" LARP (it's not called a LARP but that is what it is) taking place in the London Underground. At first I had to double-take cause it looked like an ad for Labyrinth Lord! Not exactly, but you can see what I mean. Granted EVERYONE used that Old Style font back then. It was the Morpheus of it's day. This followed by a lot of ads. Tabletop Heroes covers painting with oils, part 2. Large ads continue with some Doctor Who minis, the D&D Master Rule Set and the Tunnels and Trolls paperback fantasy/rule books. The theme is nice for issue but it makes it feel like there is less content than there really is. I used to think the same about Dragon when they did themes as well. Though to be fair, when they did themes I enjoyed then the issue seemed much more full. More than any other issue before it, WD#76 is the dividing line between the new and old White Dwarf.